This dish is so good. The combination of potatoes and pumpkin in this mash works really well and the parsley and walnuts are the perfect addition. This recipe I found in a magazine from a store. I can’t remember which one to be honest. Either the Jumbo or Allerhande. This recipe feeds about 5 people. First peel the pumpkin, remove the seeds and cut it into small pieces. Put it in a pan. Then peel the potatoes and carrots and slice them into small pieces as well. Cook for 30 minutes. Now slice and dice the onions and bake until a bit brown. Break the walnuts into smaller pieces and slice the parsley. Once the potatoes are almost done cooking, heat up the sausage. When the potatoes are done cooking, drain the water and mash it all. Add half a cup of water mixed with the bouillon cubes and mix well. 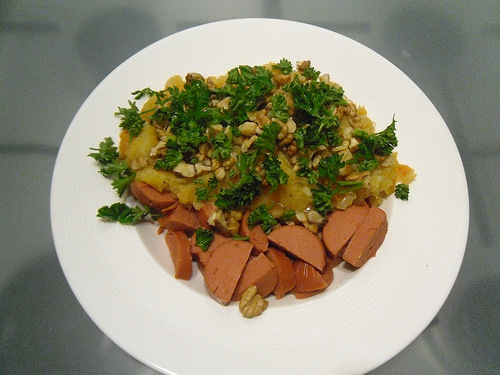 Serve the potatoes pumpkin mash with the parsley, walnuts and sausage. What’s your favorite vegetable to add to a potato mash? This does sound delicious and I’m imagining other spices besides parsley for fun flavor changes. I agree, adding different spices besides or instead of the parsley sounds like a good way to switch things up a bit. I always use a lot of veggies in my recipe. This one is really good with how the different flavors combine in the mash. I’ve never had anything like this, I’m not even sure how it would take, but I’d be willing to try it! The walnuts seem like they’d add a great crunch, although I wonder if something like shelled, roasted pumpkin seeds would work too since I used to eat this meal sometimes with pumpkin seeds and sweet potato and banana and kale I think it was? Sounds weird, but it was delicious. I don’t think I ever had shelled roasted pumpkin seeds, but it sounds like it would work. You just need something that adds a bit of a crunch and compliments the flavors of the dish. 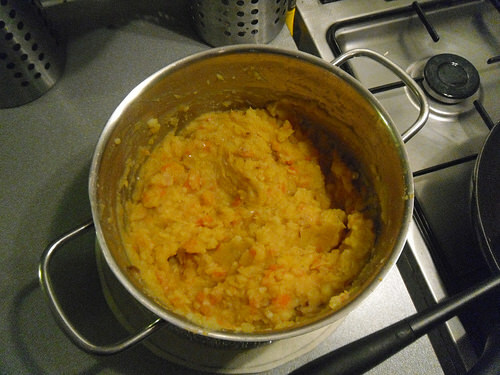 Here in the Netherlands potatoes mash with other veggies added is a very common dish and I like how this recipe had a nice twist on the common recipe. That meal you described does sound weird, but kinda good too. I don’t think I ever added banana in a dish. Does it gets mashed or added in slices? I am not a big fan of kale, but that might be because of the boring way it often gets eaten here, namely mashed with potatoes and that’s it. 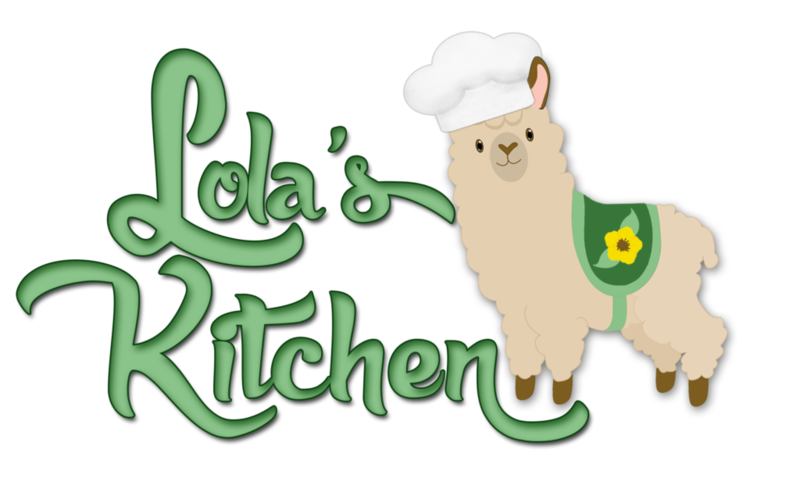 I see there are recipes for it online if you ever want to try it! I don’t think I ever hear of the word plantain. I had to translate it to dutch, but even the dutch word was only vaguely familiar. I don’t think I ever ate it. It does sound like an interesting combination of flavors. I might see if I can find a recipe for it. They’re similar to bananas, but people don’t really eat them raw. I like bananas, so I would probably would like this as well then. I’ll have to see if I can buy it here somewhere. I could definitely see myself eating this. Thanks for sharing the recipe. I am not a fan of pumpkin, but that looks yummy! Is the flavour still strong even if mixed with the potatoes? The flavor of the pumpkin is a bit less strong mixed with potatoes this well. The favors combine pretty well. You could also replace the pumpkin with only carrots maybe. Flavor wise, it’s probably a bit similar than sweet potatoes. Let me know what you think of it if you decide to give it a try :).